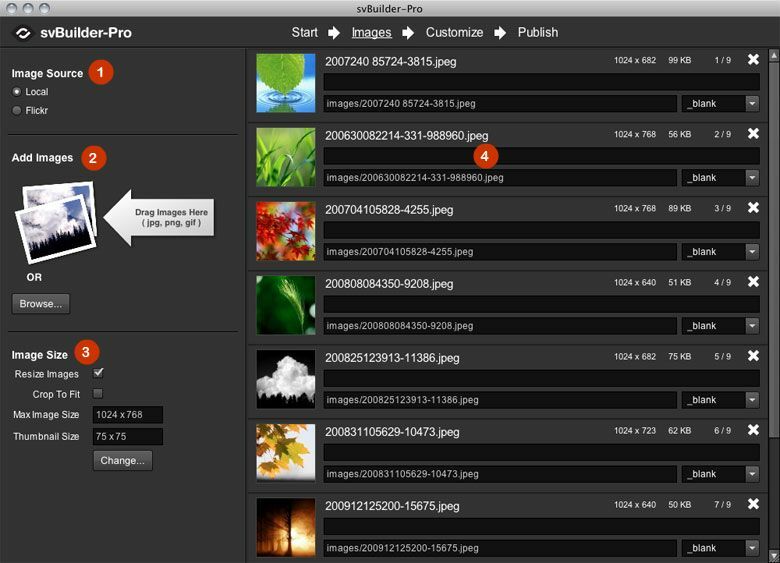 svBuilder-Pro is a desktop application that allows you to easily build SimpleViewer-Pro galleries. 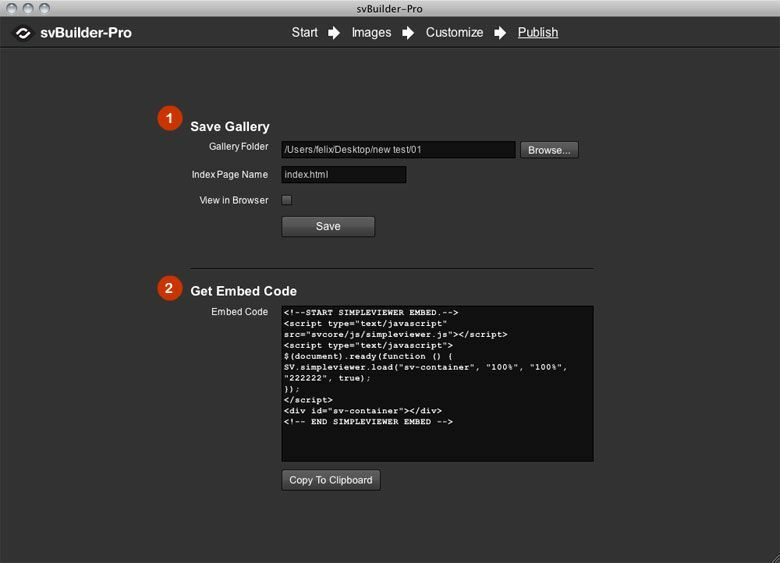 svBuilder-Pro will automatically resize images, generate thumbnails and create the required XML and HTML embed code. Download and unzip the Pro zip file using the the download link that was emailed to you on purchase. Double-Click the svBuilder-Pro.air file in the SimpleViewer-Pro download folder and follow the prompts to install. (On Windows you may need to right-click and select 'Run as Administrator...'). svBuilder-Pro runs on Windows, Mac and Linux. To resolve installation issues, check here. There are 4 main panels that make up the svBuilder-Pro interface. Use the top menu to switch between panels. Image Size. Check 'Resize Images' to make svBuilder-Pro automatically resize imported images to the specified dimensions. 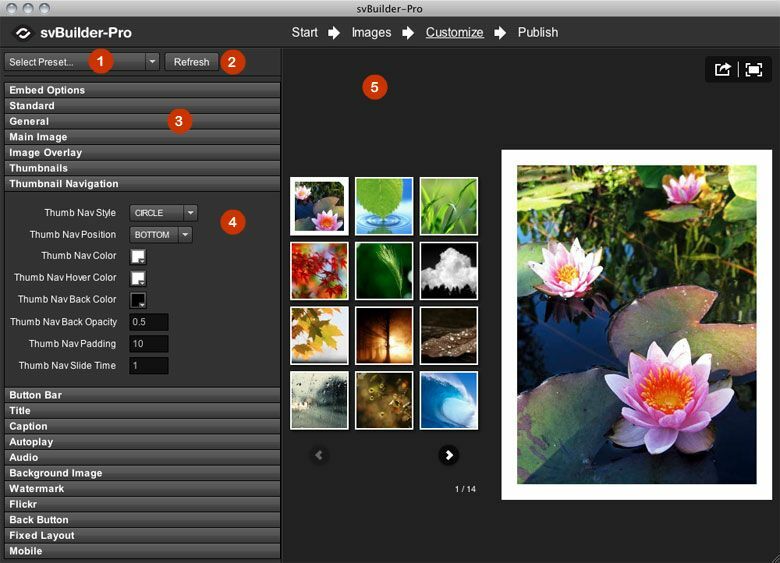 Check 'Crop To Fit' to make svBuilder-Pro crop images to the exact specified image dimensions. Click 'Change...' to change image and thumbnail dimensions and quality. Option Category Panels. Click a panel to open up the options for an option category. To save current gallery options as a preset, do Config -> 'Save Preset...'. This will save the current gallery options as a preset file. By default, preset files are saved in the svBuilder-Pro applications 'presets' folder. The 'Select Preset...' drop down menu is populated from this folder. SimpleViewer-Pro also allows you to load presets into existing galleries, check here for more details. If you receive the message "This application cannot be installed because this installer has been mis-configured. Please contact the application author for assistance." you need to uninstall the previous version of svBuilder-Pro before installing the new version. On Mac: Delete the 'svBuilder-Pro' file from Applications folder. Delete any copies of svBuilder-Pro on a backup drive. Then do 'Empty Trash'.